Address: 671623 Republic Buratia, Barguzinsky r-n, pos. Ust-Barguzin, per. Bolnitchny, 3 "g". National Park Zabaikalsky, in the Republic of Buryatia, was founded in 1986. Its area is 246,0 thousand ha, 37 thousand ha of this being water. The Park is located on the eastern shore of Baikal Lake, and it includes the peninsula of Svyatoy Nos, the southern part of the western slope of the Barguzinsky Mountain Ridge, the Ushkanyi and Chivyrkuiskiye islands, and Chivyrkuisky and Barguzinsky Bays. On the north it borders the protected area of Barguzinsky Zapovednik. The relief is middle-mountainous and high-mountainous. The bottom height belt is occupied by larch light forests with undergrowth formed by cedar elfin cover. Higher pine-larch forests with cedar are spread. Between 400-500 m and 1000-1200 m above sea level dark coniferous forests of fir, spruce, cedar are to be found; higher they change to larch and spruce light forests, with thickets of elfin cedar. From a height of 1400-1500 m above sea level mountain tundras and rocky slopes are spread; on the Barguzinsky Mountain Ridge are alpine meadow sites. On the north and around river mouths bogs are numerous. 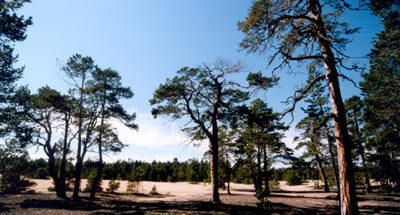 Typical taiga animals live here – roebuck, musk deer, brown bear, sable, wood grouse, hazel grouse, and black grouse. 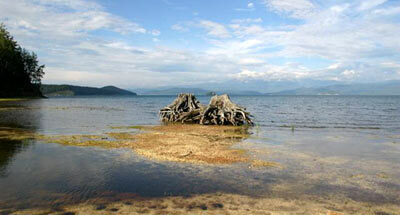 On lake Arangatuy there is a lot of waterfowl; on the Ushkanyi Islands there are Baikal seal rookeries. In Chuvyrkuisky bay live Arctic cisco, cisco, grayling, id, darter, and pickerel. 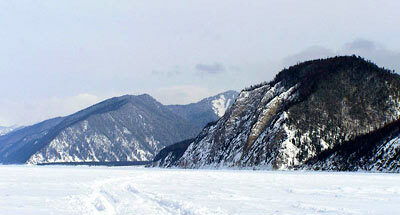 The Park belongs to the world Natural Heritage Site "Lake Baikal".